You move around the world with your party members following you. 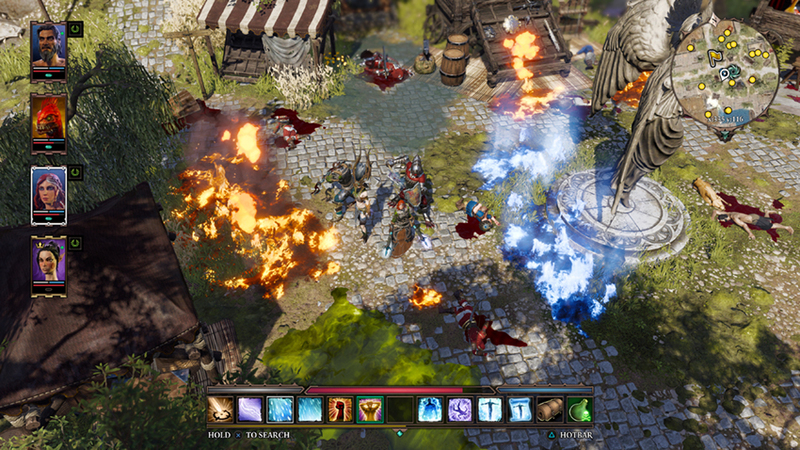 You can also split up the party and control them one by one, or in small groups. By splitting up, you can plan strategies in combat. You can go wherever you want and choose what to do and what not to do. You can open doors and if they’re not open, pick their locks, burn them down, or hit them until they break. You can climb ladders and staircases and even teleport to places you couldn’t reach otherwise. Explore the world to find people to talk to, enemies to fight, secret areas with hidden chests. Waypoints: As you journey throughout Rivellon, you will find landmark waypoints. 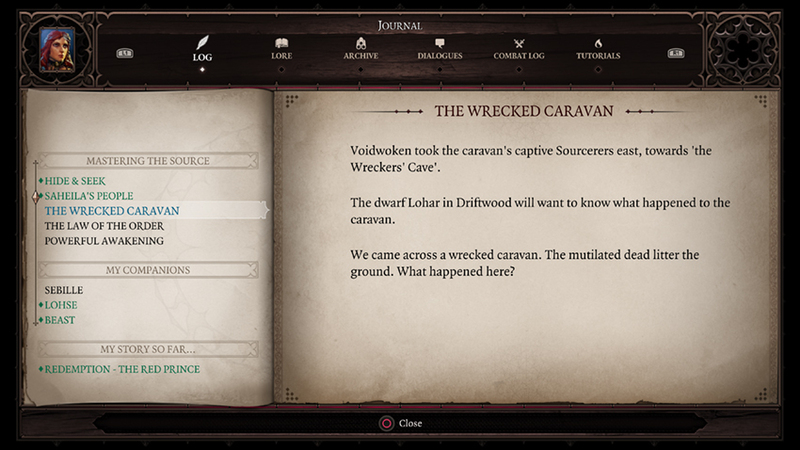 You will be able to transport your party to these previously-discovered waypoints. You can find them on your map (click touch pad) or in a list in the game menu (press OPTIONS button). Secret passages: keep an eye out for secret passages. Rivellon is full of hidden levers, pressure plates and mysterious hatches. Mysterious mounds: a high Wits score will help you notice suspicious-looking mounds now and then. Pick up a shovel: you’ll need it to dig up the treasure. Quests are a great source of experience. If someone has sent you on a quest and you finish it, make sure to go back to that NPC and tell them all about your adventure. Note that our quests are different from other RPGs you’ve played: we seldom add a “quest marker” to your map unless a location is mentioned. A quest will give you guidance and clues, but you will have to explore and investigate if you want to solve the mystery. 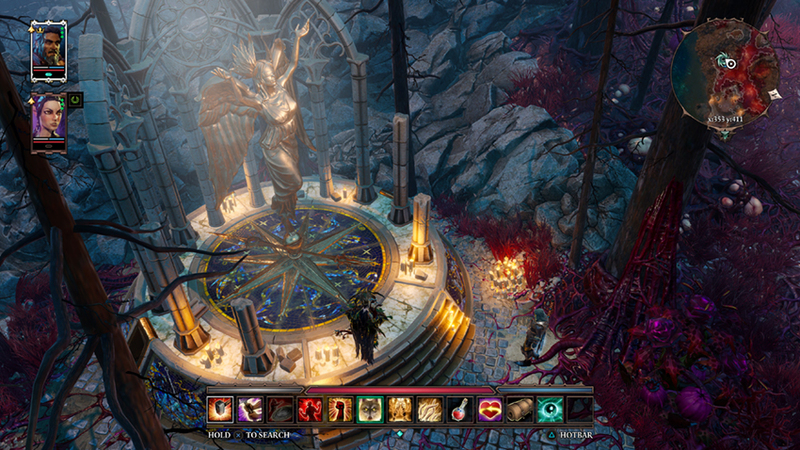 Divinity: Original Sin 2 rarely offers typical quests: we like to think more of this as situations. These situations will not always have a typical ending, or only one single solution. For instance, if your “quest” is to escape Fort Joy, there are multiple ways of doing so. 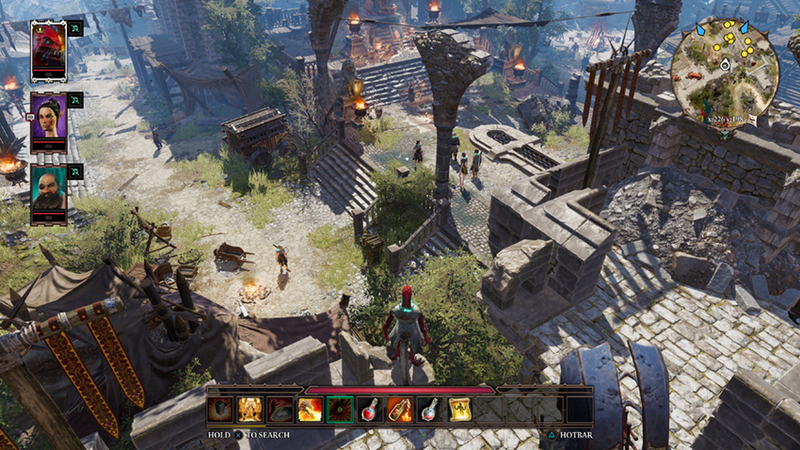 The game world is full of interactable items, some of which you can take into your inventory, and others of which you can interact with in the environment. Some items within the world such as torches, switches, and doors, are immediately affected when selected. Others may be dragged and moved around (depending on your strength), opened, closed, eaten, read, activated, destroyed, rotated, etc. Be careful though: interacting with items that are not yours are considered a crime. Items: different items have different default actions. Containers open and show their contents. Gear is picked up. Doors are opened. 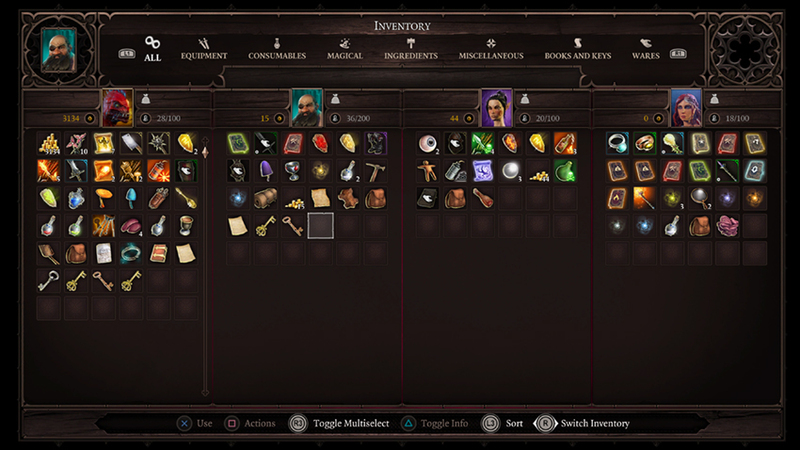 If you want more options, highlight the item and summon the action menu with the button. Active search: To easily look at all the items around you, hold the button to create an Active Search area. Moving items: highlight the item, press the button and select move. Depending on your strength, you can move the item or even throw it far away. Identifying items: some magical items need to be identified before you can use them. To identify an item, you need a certain level in the Loremaster ability. You will also need an identification glass. 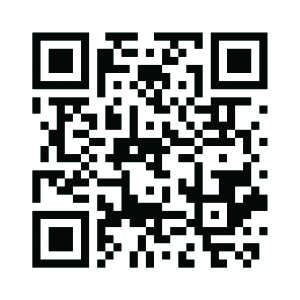 To identify, press the button on an item and choose Identify. You can also select Use on the Identifying Glass and then select the item you want to identify. Repairing items: Repairing items: Items can lose durability when using them. In order to repair your equipment, you will need to find and use a repair hammer. Disarming traps: if you have a high Wits score, you can spot traps before springing them. You can then disarm them if you have a Trap Disarming Kit. Go to your inventory, select the Trap Disarming Kit, press Use, then select the trap you want to disarm. You can talk to all friendly non-player characters in the game, trade with them, help them, or even kill them if you so choose. Killing innocent characters, however, is considered a crime. How you choose to interact with an NPC is important, as this interaction will determine whether or not they will be helpful to you. Characters: the default interaction with friendly characters is talking to them. The default action on hostile characters, is attacking them. 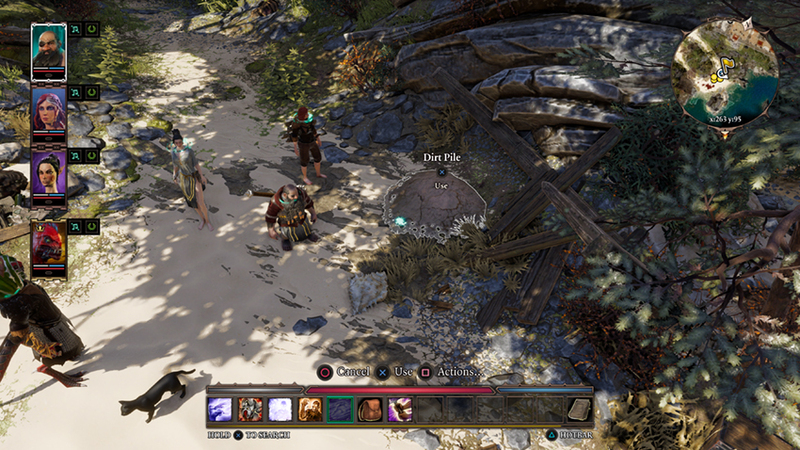 You can examine a character by highlighting a character and pressing the button. You can only pickpocket characters after entering Sneaking mode. Trading: most friendly characters will want to trade with you. If you need more variation, choice and specific items, you should look around for shops. Persuasion: Sometimes there will be moments in the dialogue where you can try to persuade them. Persuasion checks in dialogue can test your Strength (Intimidate), Finesse (Seduction), Intelligence (Reason), Constitution (Charm), Wisdom (Authority) or Wits (Mislead) stats. Each option in a dialog can have a situational or personality modifier. The Civil Ability Persuasion gives a bonus to all persuasion options. There are many ways of regenerating health. Resting is the cheapest. Select a bed to rest and slowly regenerate Vitality. Be wary of the social repercussions of relaxing in a bed that isn’t yours. Using a bedroll will instantly heal your party and give them the Rested buff. It’s a good idea to pick it up if you find one. Killing: you can kill an innocent person by highlighting them, pressing the button and selecting Attack from the menu. People that see you do this will react. If nobody sees you, the corpse may be found and may trigger an investigation! A murderer is one the loose! Stealing: you are stealing an item if it belongs to someone else. You can tell because the action is called Steal and is shown in red. Don’t get caught red-handed! If the owner of the item notices that it is missing, they will start an investigation. 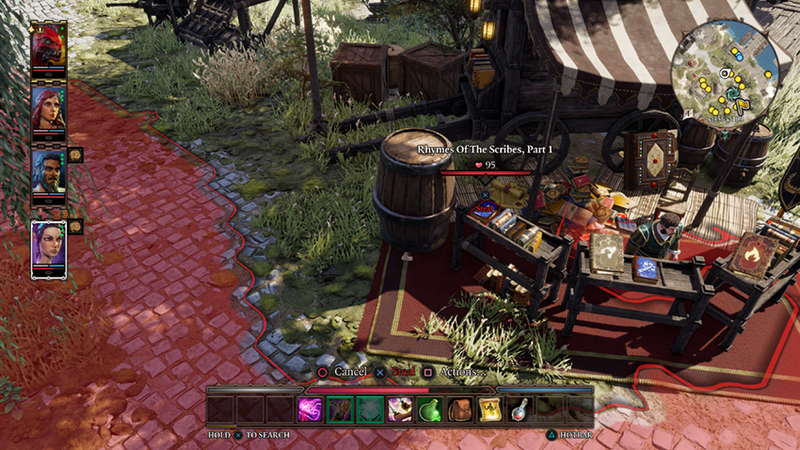 Other actions on items that are illegal are also shown in red, for instance, opening a chest that is off limits. Sneaking: you can try to reach places unseen, or sneak past enemies by going into sneaking mode. Do this by pressing directional button down. You can’t go into sneak mode if NPCs can see you. While sneaking, the player has to carefully avoid being seen, which in practical terms means avoiding getting into NPCs’ sightcones. Using Sneak is essential for pickpocketing, you can’t do it otherwise. Picking locks: once you have the Thievery ability and a set of lockpicks (or an undead boney finger), you will be able to pick the locks of doors and chests. Select the item, press the button and select lockpick. Or simply press use on a lockpick item and then select the door or chest. Pickpocketing: you can pickpocket from NPCs by going into Sneak mode and then pressing the button. What you can steal is limited by weight and value based on your thievery skill.